(Nanowerk News) A new technique for visualizing the rapidly changing electronic structures of atomic-scale materials as they twist, tumble and traipse across the nanoworld is taking shape at the California Institute of Technology. There, researchers have for the first time successfully combined two existing methods to visualize the structural dynamics of a thin film of graphite. Described this week in the journal Structural Dynamics ("Ultrafast Core-Loss Spectroscopy in 4D Electron Microscopy"), from AIP Publishing and the American Crystallographic Association, their approach integrated a highly specific structural analysis technique known as "core-loss spectroscopy" with another approach known as ultrafast four-dimensional (4-D) electron microscopy -- a technique pioneered by the Caltech laboratory, which is headed by Nobel laureate Ahmed Zewail. Short electron pulses excite deep core-level electrons in materials providing snapshots of the structural dynamics after laser excitation. 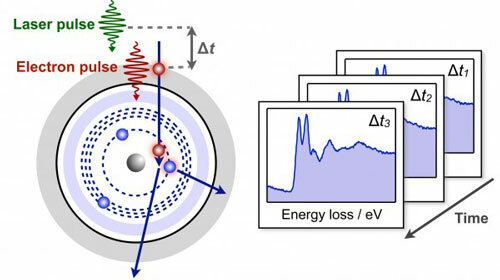 In core-loss spectroscopy, the high-speed probing electrons can selectively excite core electrons of a specific atom in a material (core electrons are those bound most tightly to the atomic nucleus). The amount of energy that the core electrons gain gives insight into the local electronic structure, but the technique is limited in the time resolution it can achieve -- traditionally too slow for fast catalytic reactions. 4-D electron microscopy also reveals the structural dynamics of materials over time by using short pulses of high-energy electrons to probe samples, and it is engineered for ultrafast time resolution. Combining these two techniques allowed the team to precisely track local changes in electronic structure over time with ultrafast time resolution. "In this work, we demonstrate for the first time that we can probe deep core electrons with rather high binding energies exceeding 100 eV," said Renske van der Veen, one of the authors of the new study. "We are equipped with an ultrafast probing tool that can investigate, for example, the relaxation processes in photocatalytic nanoparticles, photoinduced phase transitions in nanoscale materials or the charge transfer dynamics at interfaces." Integrating the two techniques proved challenging. Because electrons repel each other, there are only so many electrons that can be packed into one pulse. As you shorten each pulse to increase the time resolution, each pulse then contains fewer electrons, and the chance of interaction between the probing electrons and the core electrons decreases. Particularly at the high energy levels required to excite the deep core electrons (1st and 2nd electron shells), "the signal from many electron packets must be integrated over a long time," explained van der Veen. The researchers tested their technique on graphite thin-films, demonstrating that laser excitation causes the in-plane carbon-carbon bonds in the structure to expand and the π-π energy gap to shrink on the picosecond (one trillionth of a second) time scale. Core-loss spectroscopy is in some ways similar to X-ray absorption spectroscopy, but it has a few critical advantages. "Using X-rays, the study of individual nano-objects and the in situ atomic-scale imaging of materials remains quite challenging. In this respect, ultrafast core-loss spectroscopy in electron microscopy provides a huge advantage. Imaging, diffraction and spectroscopy are all combined within the same table-top setup; complementary information about the same sample can readily be obtained," said van der Veen. The ability to visualize the ultrafast dynamics of individual atoms has broad applications across scientific disciplines, from materials science to biology. The researchers hope that future developments in "pulsed electron sources and detection methods" will enable their technique to be used in more advanced experiments.